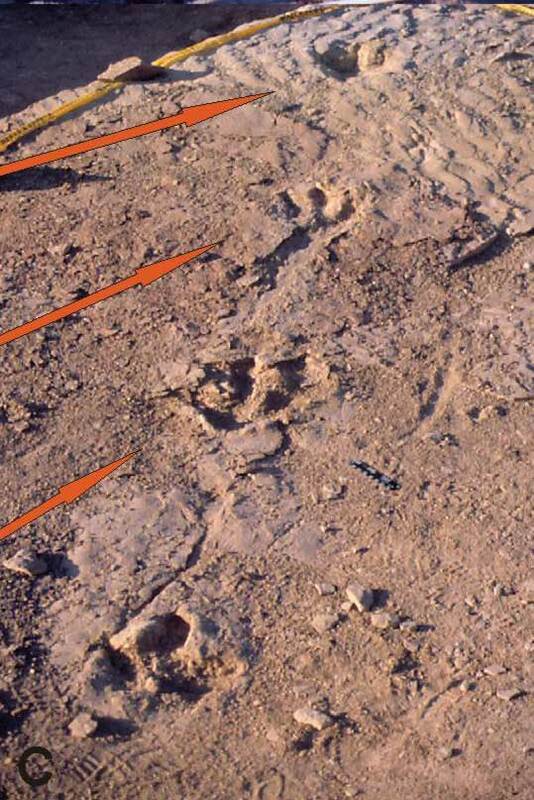 Clear pelvic impressions and tracks of shuffling feet as the animal stood up and walked away. As it stood up, it dragged its tail. Dinosaurs typically held their tails off the ground as they walked, and tail drags are rarely preserved. A vast number of tracks have been discovered at this site, but this find is by far the most exciting track discovery yet. Jim Kirkland, the state paleontologist, said the new discovery clearly shows the animal rested on its hind end and put its hands down, with claws curled inward, giving scientists new insight on how dinosaurs held their hands. It then shuffled forward before getting up and walking away, while dragging its tail. 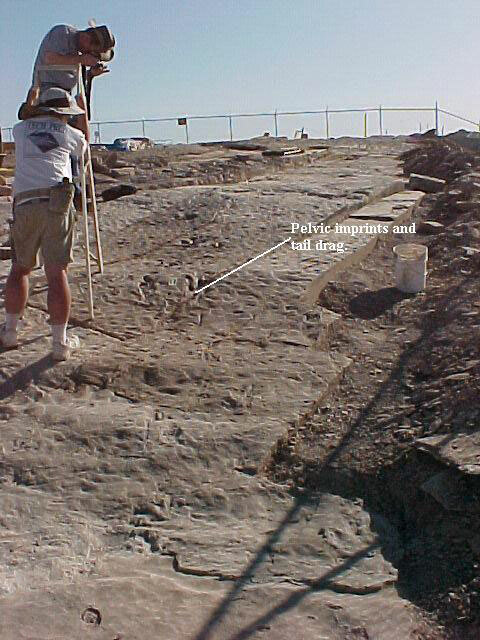 Back in Early Jurassic time (200 million years ago), a shallow, saline lake stretching hundreds of miles existed in southwestern Utah. Dinosaurs congregated on the shores of this lake. 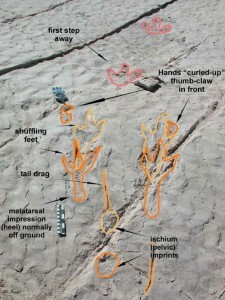 Dinosaurs might have crouched there on the shores after eating fish or plants, stood up and walked away. 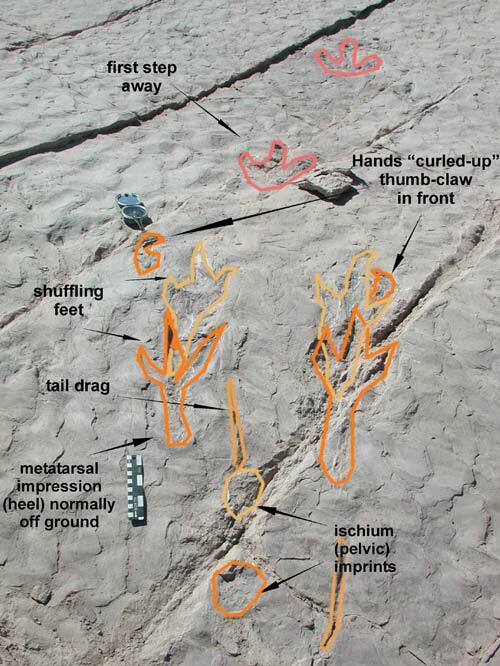 This behavior is recorded at the lower part of the trackway with the tail drag. 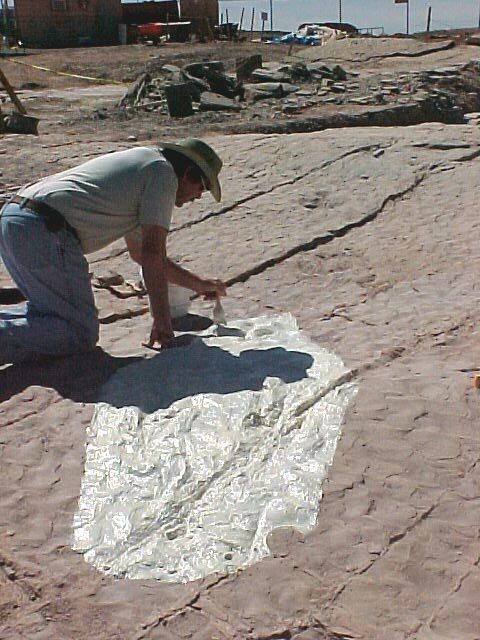 Since Sheldon Johnson’s initial track discovery in 2000, this site has grown into North America’s largest site for Early Jurassic footprints. 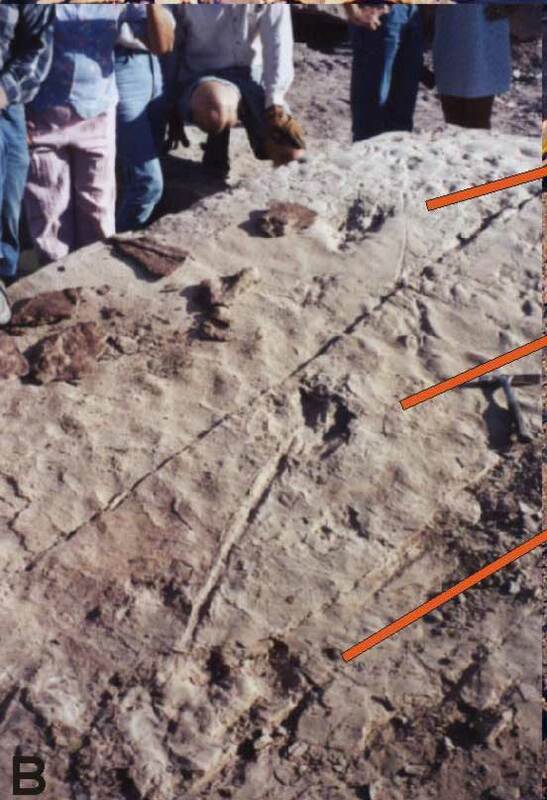 The majority of the tracks are well preserved at the bottom of a 3-foot-thick sandstone layer of the Moenave Formation and are of the track name, Eubrontes, meaning three-toed footprints. They include exquisite examples of footpads, claw marks, and detailed skin impressions. 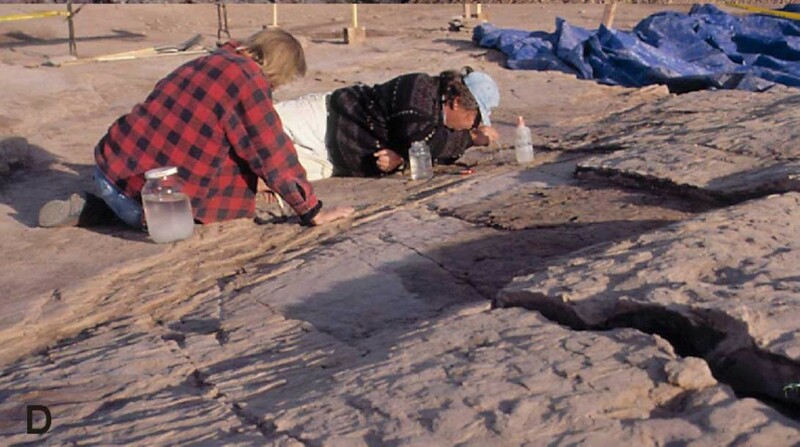 Ongoing research has resulted in the discovery of several species of dinosaur tracks, fossil plants, invertebrates, and several fish fossils, including bones of Coelacanth, a prehistoric 5-foot-long fish once thought to be extinct, but found living off the coast of Africa. Ongoing weathering of the tracks has prompted funding from federal and state governments, as scientists work to protect and preserve the site for science and public education. 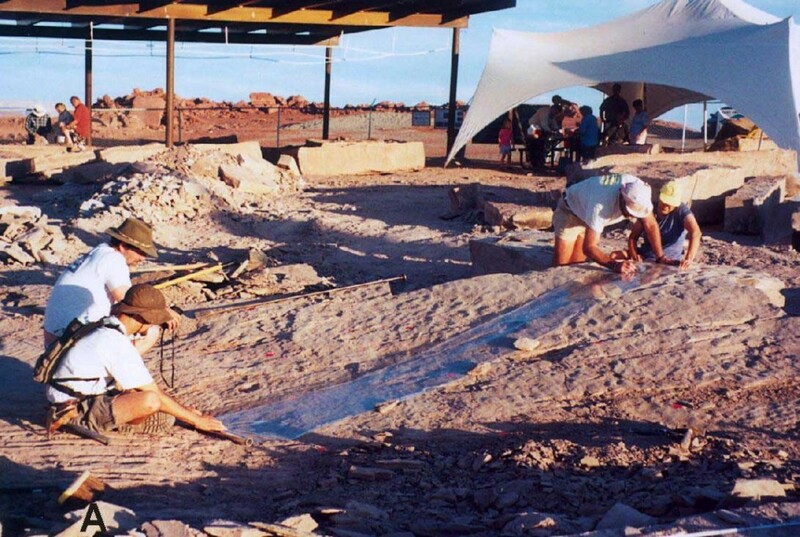 In an effort to continue the preservation, the Johnson family donated the initial tracks to the city of St. George who then purchased the land and began construction of a 16,000 square-foot interpretive center in the summer of 2004. The center will be an important geologic and paleontological site, providing a unique educational opportunity unequalled in any museum.